The ancient city of Amritsar that flourished under the royal patronage of Maharaja Ranjit Singh witnessed large-scale destruction of its invaluable heritage after his (Maharaja’s) death. The historical gates, which used to protect the city from invaders, were demolished one by one with the passage of time. Shree Lakshmi Narayan Stitching School, run by the Shree Durgiana Temple Management Committee, was established in 1992. It has been doing a yeoman's service for the cause of women, especially those belonging to the weaker sections of the society. Youngsters interested in trying their luck at Bollywood should avoid shortcuts and they should work hard to fulfill their dreams of becoming successful actors, said Bollywood actor Anil Kapoor, who was here to pay obeisance at the Golden Temple. Over 300 students of Sri Guru Harkrishan Senior Secondary Public School, run by Chief Khalsa Diwan, gave a performance during the two-day light and sound show Apni Dharti Apna Virsa. Aarti Puri, a city girl, who is the heroine of Punjabi comedy film Nalaik, was here to pay obeisance at the Golden Temple on the release of the movie. 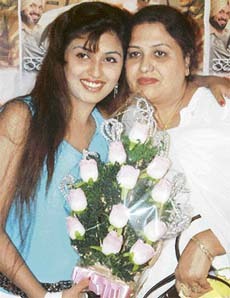 Her debut film Mahaul Theekh Hai was a hit. The one-day national seminar on astrology, held under the aegis of the Indian Council of Astrological Sciences, here recently predicted that by 2007 India would become a permanent member of the UN Security Council and that by 2020, the country would emerge as the major superpower of the world. The annual credit plan of this border district for the year 2005-06 was announced here recently. While launching the annual credit plan, Mr Kirandeep Singh Bhullar, Deputy Commissioner, envisaged a disbursement of Rs 1873.72 crore. He projected an increase of 23.35 per cent as compared to the last year's target. The ancient city of Amritsar that flourished under the royal patronage of Maharaja Ranjit Singh witnessed large-scale destruction of its invaluable heritage after his (Maharaja’s) death. The historical gates, which used to protect the city from invaders, were demolished one by one with the passage of time. The rich heritage was vandalised when the Sikh leadership was totally demoralised after the annexation of Punjab by the British following the death of Maharaja Ranjit Singh. Though the British administration tried to re-construct some of the historical gates, most of the sites were named after English administrators. Mystery shrouded the “disappearance” of two historical darwazas (gates) named after two Sikh warriors — Jassa Singh Ramgarhia and Jassa Singh Ahluwalia. Most of the heritage lovers are not aware when and why the rich heritage belonging to the period of Maharaja Ranjit Singh was demolished. However, a map of the Municipal Committee, Amritsar, published before the death of Maharaja Ranjit Singh depicts 12 historical gates, including Darwaja Ramgarhia and Darwaja Ahluwalia. 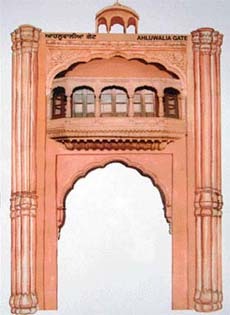 (Top and below) Proposed designs of Ahluwalia and Ramgariha gates. 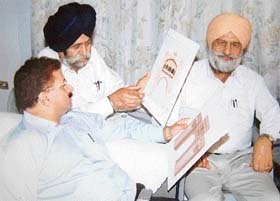 On the basis of the clue, found in the two old maps of Amritsar Corporation (1849 and 1947), Mr Onkar Singh Sandhu and his team presented to the Mayor the proof that the gates were in good condition before Partition. Moreover, history books point out that the Chattiwind and the Ghee Mandi gates were named after Jassa Singh Ramgarhia and Jassa Singh Ahluwalia, respectively. Mr Sandhu approached the Mayor, Deputy Mayor and senior functionaries of the local municipal corporation and the SGPC for re-construction and renaming of the old demolished gates. He urged them to rename these gates after the names of great Sikh warriors to keep the rich heritage alive. The book — “Amritsar, a study in urban history” by Anand Guaba, and “Sri Amritsar” — a book by Giani Gyan Singh Tehrik — clearly show that the Chattiwind and the Ghee Mandi gates were called Ramgarhia and Ahluwalia darwajas. The Ramgarhia Federation said its demand to rename the two gates was genuine, as it was based on research. The federation also demanded to rename Katra Ramgarhia, which was developed in 1760 and was located between the Gilwlali Gate and the Doburji Gate (Sultanwind Gate) and was surrounded by Katra Dal Singh, Katra Mit Singh and Katra Garbha Singh which is based on record. Expressing concern over the indifferent attitude of all concerned, Mr Sandhu said Sikh institutions should immediately come forward to preserve the rich Sikh heritage. “I had heard from my elders about Katra Ramgarhia when I was in school. My inquisitive mind took me to various libraries. All books stated that Ramgarhia was the biggest Katra. Then we found an 1849 map of Amritsar in Anand Gabha’s book (A study in urban history). The book mentioned the existence of various historical gates, including Darwaja Daburji (Sultanwind Gate), Darwaja Ramgarhia (Chatiwind Gate), Gilwali Darwaja and Katra Ramgarhia,” said Mr Sandhu. The Ramgarhia Federation believes that these gates were demolished after the death of Maharaja Ranjit Singh. The Ghee Mandi was earlier the Ahluwalia Gate which was the direct route to the Ahluwalia Qila. However, with the passage of time, the area emerged as the Ghee Market and hence it was popularised as the Ghee Mandi Gate, and the old historical name was virtually forgotten by the residents. Thanks to the efforts of the Ramgarhia Federation, the local municipal corporation passed a resolution on January, 15, 2003. The corporation agreed, in principle, to rename the Sultwanwind Gate. Mr Sandhu said that initially no one was ready to accept his point that the Ahluwalia Gate and the Ramgarhia Gate had existed. “We distributed a number of copies of the old maps to senior officials and politicians to substantiate our claim that bore fruit ultimately,” he said. Mr Sandhu said that when a deputation of the Ramgarhia Federation had met the present Congress Mayor, Mr Sunil Dutti, Mr Om Parkash Gabbar, Deputy Mayor and other senior councillors, they had immediately promised to pass a resolution in that regard. Earlier, at least three MLAs and senior SGPC members had strongly recommended their case. 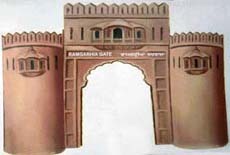 While the design of the Ahluwalia Gate has been picked up from the Ahluwalia Qila, the design of the Ramgarhia Gate has been copied from the old picture of the Qila Ram Rauni, which was reportedly demolished during the time of Maharaja Ranjit Singh. Though the municipal corporation passed a resolution to reconstruct the historical gates about two years ago, the SGPC has shown indifference in restoring the old Sikh heritage. The Ramgarhia Federation alleges that despite a number of representations made to the Shiromani Committee, it has failed to elicit any response. Mr Sandhu said that the SGPC should either construct these gates at its own level or help the federation with building material so that the gates could be reconstructed at the earliest. It is a matter of concern that though the senior SGPC members had strongly recommended the reconstruction, the Dharm Parchar Committee has reportedly rejected the case without assigning any reason. Sardar Jassa Singh Ramgarhia, son of Giani Bhagwan Singh, was born in 1723. His ancestors were great Gursikhs devoted to Gurbani and sewa. They lived in the village of Ichogil, near Lahore. His grandfather took amrit during the lifetime of Guru Gobind Singh, and joined him in many battles. Later, he joined the forces of Baba Banda Bahadur. Jassa Singh was a born leader of unprecedented qualities. He was five years old when Banda Singh Bahadur attained martyrdom at Delhi. Under Dal Khalsa, Jassa Singh established his misl of Ramgarhia in and around Riarki area of Amritsar, Gurdaspur and Batala. He also fortified and constructed the fort of Ram Rauni at Amritsar. His misl had more then 5000 cavalry, always on move and helping Dal Khalsa whenever Afghanis or Mughals attacked. He occupied the area to the north of Amritsar between the Ravi and the Beas rivers. He also added Jalandhar region and Kangra hill areas to his estate. He had his capital at Sri Hargobindpur, a town founded by the sixth Guru. The large size of Jassa Singh’s territory aroused the jealousy of the other Sikh misls. Jassa Singh Ahluwalia was born (1718-1783) at a village called Ahlu or Ahluwal near Lahore, established by his ancestor, Sadda Singh, a devotee of Guru Hargobind. Hence, the name Ahluwalia stuck to him. Jathedar Jassa Singh Ahluwalia was honoured with the title of Sultan-ul-Qaum (King of the Nation). Son of Badar Singh, Jassa Singh was hardly five years old when his father died (1723 AD). His mother entreated Mata Sundri, wife of Guru Gobind Singh, to take him into her care. Mata Sundri agreed to do so, and lavished much affection on him, instructing him carefully in the arts of war and peace. He studied Sikh scriptures under Bhai Mani Singh. Sardar Jassa Singh was also called “Bandi Chhor” (The Delivered) for having rescued 2200 Indian women made prisoners by Abdali for his harem. Under the leadership of Jassa Singh, the Dal Khalsa took over Lahore, the capital of Punjab, for the first time in 1761. Abdali thought that having demolished their fort and desecrated their holy sarovar, he had made Sikhs unable to face the Afghans. However, within months, the Sikhs, guided by Ahluwalia, were strong enough to make Afghans their prisoners and also make them clean up the Amrit Sarovar. Within a few years, the same Abdali feared the Sikhs so much that he did not dare follow his usual route through Punjab to return to Kabul. Having led the Sikhs through very trying times, Jassa Singh passed his last years in Amritsar. With the resources available to him, he got the buildings repaired, improved the management of the gurdwaras, and provided better civic facilities to residents of Amritsar. Shree Lakshmi Narayan Stitching School, run by the Shree Durgiana Temple Management Committee (SDTMC), was established in 1992. It has been doing a yeoman's service for the cause of women, especially those belonging to the weaker sections of the society. 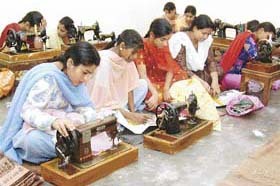 Students are imparted training in stitching and embroidery, absolutely free of cost. They are also taught the art of applying mehndi. Ms Veena Kumari, who has been teaching in the institution since 1992, told TNS that two batches in forenoon and afternoon were held daily. "There are about 20 to 25 students in each batch. The school has not fixed any time limit and the students can continue their training till they achieve expertise in their trade," she said. One of the students Archana, who joined the school last month, was all praise for the institute and its teachers. She said that she was fast learning the stitching work. She further said after completing the course she would open her own boutique in her house. Another student Preetikee, who joined the school four months back, said she joined the school for learning embroidery work. Mr Surinder Arjun, working president of the SDTMC, told TNS that the salary and other expenses of the staff were about Rs 1 lakh per annum. Stitching and embroidery machines were provided by the SDTMC, he added. He further said that earlier students used to be charged a nominal amount of Rs 10 per month, but new committee had totally waived off the fee since the last year. He refused to comment on the recent controversy over the sting operation conducted by an electronic channel showing certain television and film personalities demanding sexual favours from "aspiring actresses". 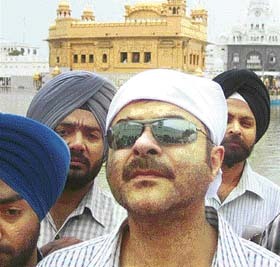 Anil Kapoor, who hogged the limelight in films like Woh Saat Di, Mister India, Tezaab, Ram Lakhan in the early nineties, said that he did not have any words to explain the spiritual feeling he had experienced after paying obeisance at the Golden Temple. He said he had two of his movies, including No Entry and My wife's Murder, in the pipeline. These would be released in the next couple of months. He said he was hopeful that the films would do good business and that the audience would appreciate his work. Expressing his keen desire to work in a Punjabi film, he said he would love to do a good-banner Punjabi film with a strong story line. He said he was impressed by the warmth and hospitality of the Punjabis. He added that he had enjoyed the local food, which included aloo kulcha, puri and lassi. When asked about the criteria of selecting the films, he said he had now matured and that he wanted to do selective roles that would satisfy the actor within him. Over 300 students of Sri Guru Harkrishan Senior Secondary Public School, run by Chief Khalsa Diwan, gave a performance during the two-day light and sound show Apni Dharti Apna Virsa. The show brought into focus the fixation of Punjabis to settle abroad and the agonies of those who are left behind. The light and sound show was presented on April 22 and 23. Directed by Kewal Dhaliwal, the show unfolded the saga of illegal immigration of Punjabi youth to Western countries. The show depicted how some unemployed youths go to foreign shores with the help of so-called travel agents. The ignorant and gullible youths, in their haste to reach their destinations, are duped by the travel agents, who promise them lucrative jobs, high salary and a high standard of living. The show highlighted the plight of those who are able to make to the foreign lands. Those who reach the alien lands are also not lucky. Many of them try to illegally enter prosperous Western countries and are arrested. They are forced to live in abominable and inhospitable condition. The show also depicted Punjabi festivals and fairs. It highlighted the nostalgic feelings of foreign-settled Punjabis. Talking about her latest release, she said, "The film Nalaik is a comedy in which a police commissioner's son wants to become a dacoit. Special appearances by Hindi film star Bobby Deol and Punjabi comedy king Jaspal Bhatti add to the movie's charm. The film's cast includes Vivek Shauq, Guggu Gill, Rana Jung Bahadur. Co-produced by Vivek Shauq and Ravi Nishand, it has been written and directed by Ravi. The music has been rendered by Anand Raj, songs are by Baba Sehgal, Jaspinder Narula, Shankar Sawhney." It was in tele-serial Patake Tha aired on Alpha Punjabi, where she played the lead role, that she gained recognition. Talking to The Tribune here, Aarti said she was eager to perform serious and emotional roles, though presently she had been slotted as an actress who excelled in comedies. On the issue of casting couch in Bollywood, she admitted that it existed, but was only for those who wanted to take short-cuts in life. Her forthcoming films are Shadyantra, Dharm shakti, My Husband's Wife, Dil Da Mamla. She has acted in Telugu and Kannada movies, too. An alumna of Arya School and Khalsa College here, she gave the credit for her success to her father who, she said, had encouraged her to opt for acting as a profession. Presiding over the convention, Justice (Retd) S.N. Kapur, who is also the national president of the Council of Astrological Sciences, said that there would be a definite improvement in the relations of India and Pakistan which would go a long way to provide stability in the region. Justice Kapur said that this council had been established in 1984 with 8000 permanent members. The council had 22 chapters and 20 centres throughout the country. He said that at present there were about 86 lakh astrological websites in the world. He said that astrological sciences were popular not only in India, but also they were gaining credibility in Islamic countries like Pakistan, Iraq, Iran and Egypt. He, however, added that predicting future correctly was a "hazardous proposition". He pointed out that the study of astrological sciences was quite tough and it required complete research and dedication. He said the plan would focus on weaker sections of the society. It would ensure socio-economic development in agricultural sector, industrial sector and trading sector. It was important to pay attention to rural industrialisation through small-scale industrial development, he added. He said the total priority sector outlay for the district was envisaged at Rs 1873.73 crore, covering 375739 beneficiaries, out of which total investment under agriculture and allied activities had been earmarked at Rs 1198.16 crore, for non-farm sector at Rs 383.98 crore and for other priority sectors at Rs 291.58 crore. The Dalit Welfare Society celebrated the 115th birth anniversary of Dr Ambedkar with great fervour here. Mr Jugal Kishor Sharma, MLA and Chairman, Amritsar Improvement Trust, was the chief guest, while Mr Sunil Datti, Mayor, presided over the function. The function was inaugurated with lighting of the lamp. Speaking on the occasion, Mr Sharma said that Dr Ambedkar had given in the Indian Constitution the rights of equality to all sections. He said the people should follow the path shown by Dr Ambedkar and that it would be the real tribute to the man who had scripted the Constitution of India. DATA Tech College, Canada, inaugurated its overseas headquarters in India, here recently. Ms Kavita K. Kasandas, president of the college, while inaugurating the college, said that DATA Tech College (India) aimed at providing education in various fields like multimedia, digital desktop publishing, Information Technology, accounting. Mr Satinderjit Singh Thind, director, operations (India), said that the Indian unit of the college was authorised to open more branches at different locations. 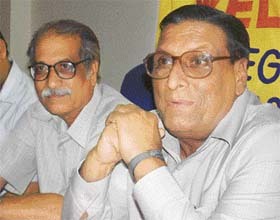 The Federation of Indian Rationalist Associations (FIRA), an association of nearly 50 rationalist, secularist, humanist, atheist and scientific organisations from different Indian states, in a draft bill, has demanded the separation of religion from politics, educational system and judiciary to make India a secular nation in true sense. The activists of FIRA organised demonstration in front of the Parliament House, New Delhi, and presented the draft bill to President, Vice-President and Prime Minister, according to the Tarksheel Society, Punjab. Prof Narendra Nayak, national president of the association, in the draft bill, also sought the cancellation of recognition of political parties asking votes in the name of religion and caste. He said that the involvement of government institutions in the religious functions should also be banned. Mr Parvinder Kumar was elected as president of the Income Tax Employees' Federation, Group C, Amritsar Unit, while Mr Chanchal Singh was elected as vice-president. Mr G.L. Rana was elected as secretary, Mr Sunil Arora as joint secretary, Mr Sham Lal as assistant secretary and Mr Rajinder Singh as treasurer of the federation. The local MP, Mr Navjot Singh Sidhu, has granted financial aid to Muradpura School for construction of two rooms and purchase of furniture. He also gave Rs 25,000 for the repair of the streets, drainage system and sports club at Chogawan village. He gave Rs 25,000 to sports club at Bhoi village. The Punjab State Council for Science and Technology, in association with Manav Public School, organised the National Science Day. In the programme that was organised, local schools participated in various competitions. Shailja Sharma of Manav Public School and Kanika Verma of Sacred Heart School stood first in junior and senior sections declamation contest, respectively. In science project, Pallavi of Manav Public School stood first and Hirani Swaminathan of Army Public School stood second. Tamnna Tuli of Manav Public School and Palak of Sacred Heart School secured first position in junior and senior category, respectively, in poster competition.